A competitor of Pixar Animation surely has no leeway in regards to success. I mean, can other studio animations really rival the brilliance of features such as Toy Story, Finding Nemo and the latest, Brave? Well, they sure can try. However, with trying comes the inevitable competition, and with competition and standards appreciation can often be left adrift. Dreamworks Animation is Pixar's biggest competitor and with feature and feature, they're slowly but surely paralleling the aforementioned studio's greats. First came Shrek, with sequel after sequel truly bursting the studio into the limelight. Then similar successful franchises followed suit -- Madagascar and Kung Fu Panda, primarily -- before Monsters Vs. Aliens, Megamind, Rise of the Guardians and, my personal favourite, How to Train Your Dragon hurtled it from minimal success to a box office smash. 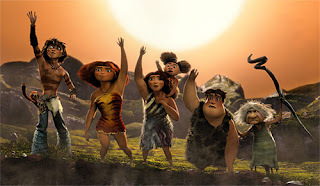 The Croods is Dreamsworks' latest, following the family Crood, a prehistoric gang of cavemen whose leader of the pack, Grug Crood, shields his family from the dangers of the land. However, the arrival of a prehistoric genius, Guy, triggers a magnitude of life-altering situations for The Croods, forcing them into the world they've grown so accustomed to hide from. This prehistoric family must revolutionise and modernise themselves in order to survive extinction. It's actually rather startling that cinema hasn't, as of late, featured more cavemen. The last that triggers a sour memory was the Jack Black and Michael Cera vehicle Year One -- maybe this is why there's been a four year anti-cavemen stance. Maybe it's why The Croods is so refreshing, and in turn has become, or in due course will become so successful. This is brisk family entertainment at its epitomised best. Thanks to a worthy and consistently effective range of charismatic voice work from the likes of the already-charismatic and deathly-lovable Emma Stone, Nicholas Cage, Ryan Reynolds, Catherine Keener and Cloris Leachman, The Croods are instantly known. The characters are wild -- much like their caveman status -- and rambunctious, failing to drift into the background of wild colours and exciting action sequences as they grow more and more boisterous and infinitely more warming. And it's by stretch the best Cage performance in quite some time -- the animation barrier doesn't help either. A fully-ranged sense of the word as "family entertainment" is attached as The Croods at times address obvious economical problems, and the inevitable extinction number that we're all expecting this animated epic to end on, and by so, the adults are in for just as much of a wild ride as the kids. Kinetic and dutifully grand in scale, the action is outstanding and merely aids the enormous amount of colour and general visual spectacle that The Croods are experiencing as much as its audience, and while this can be expected, it outstretches that of some of Dreamworks' previous works. Its core is family. It's heartwarming and thoroughly poignant, from moments of sentimentality between father and daughter to Emma Stone's burly Epe finding complete wonderment in the world she's sought and dreamt of for so long. An introduction to a whole new world is eye-opening, thus inducing the third dimension to extraordinary factors. From an opening hunting skit to the enormous wilds of jungles and mountains, the landscape is dazzling and so fits the screen like a glove. It never bores and for the most the comedy is spot-on, but as the family grows increasingly more modernised and experiences a dozen new factors of life, i'd be surprised if you didn't find yourself in a state of overwhelming warmth and heart. It's written wonderfully, and while it doesn't compete to the poignancy of Finding Nemo or that last chapter of Toy Story 3, it's attempts are honourable. I had an absolute blast, and i know you will too. Verdict: One of Dreamworks' best as voice acting parallels that to the adventure waiting to be had: an extravagant and successful trip through a prehistoric era with an exuberant, wild and joyously lovable family. You'll laugh, you'll shed a tear, it's a trip worth admission.